I initially read this book a few years ago and decided to try out the full cast audiobook that came out last year with the terrible movie. 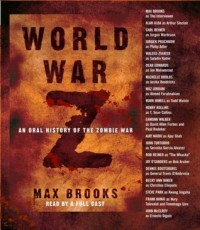 This book almost works out better as an audiobook than a book, since the entire book is made of chapters taken from interviews of people before, during, and after the zombie war. I would have edited some of the lines where the interviewer narrates what they are doing so it would really come off as the tape of an interview versus the transcript.